LIFE HAS CHANGED, SOCIETY HAS CHANGED, THE WORLD HAS CHANGED. TO FIND ONE`S WAY, ONE HAS TO UNCHAIN HIMSELF, HIS MIND, HIS SPIRIT AND HIS BODY. IF YOU ACCEPT LIFE AS A CHALLENGE: TO DO MORE, TO KNOW MORE, TO SEE MORE, THEN YOU ARE PREPARED FOR THE FUTURE. 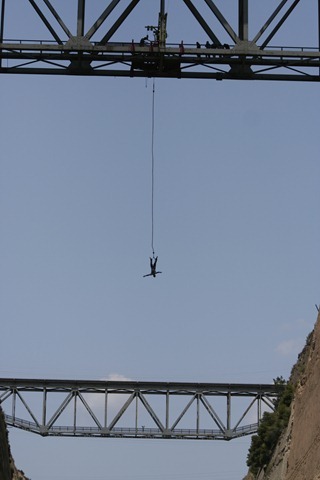 WE OFFER PARTICIPATION IN A DIFFERENT CHALLENGE: TO BUNGY-JUMP INTO ONE OF THE GREATEST, MOST HISTORICAL AND FAMOUS PLACES IN THE WORLD. 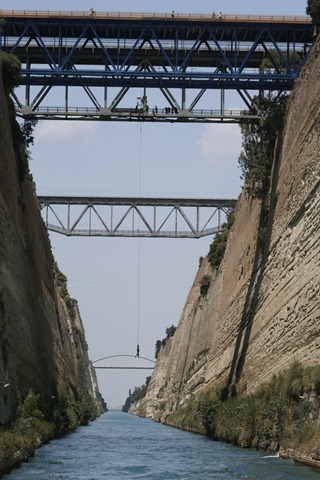 -THE ZULUBUNGY INTO THE CORINTH-CANAL – IF YOU TRAVEL TO GREECE, ATHENS OR PELOPONNESE, DON\’T MISS THIS UNFORGETTABLE ULTIMATE OUTDOOR-EXPERIENCE.IT WILL BE THE HIGHLIGHT OF YOUR TRIP .NOTHING CAN DESCRIBE THE SMILE ON YOUR FACE AFTER YOUR JUMP. BUT YOU WILL REALIZE THAT: EVERY CHALLENGE YOU UNDERGO WILL BRING YOU ONE STEP FORWARD IN LIFE. GET READY! CONTACT US AND A FRIENDLY TEAM WILL ASSIST YOU TO HAVE THE EXPERIENCE OF YOUR LIFE! But the site is indeed a popular one. 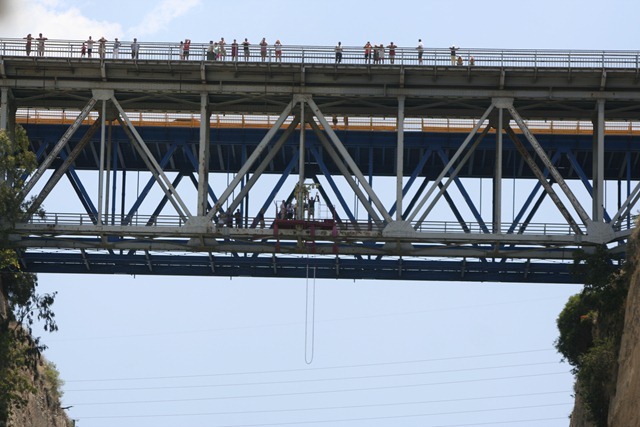 The Isthmus now numbers among the premier destinations in the world for this kind of extreme sport (see 20 amazing places to bungee jump) and I’m finding YouTube videos of canal jumps increasingly filling my Google alerts. Check out, for example, this one here and here. This one proves what an old friend had once told me (and which I did not believe)—that you can ask the operators for enough cord to hit the water. Sure enough, as Zulu’s website notes, “WATERTOUCH AVAILABLE THAT WILL ALLOW YOUR HEAD TO JUST KISS THE WATER.” Awesome. Good shots. I jumped at 56 years of age in 2010. I was leading Harding University’s study abroad program in Greece at the time.